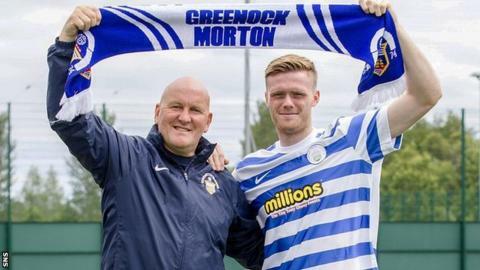 Morton manager Jim Duffy believes the signing of Denny Johnstone will benefit both the club and the player himself. The on-loan Birmingham striker scored on his debut against Elgin in the League Cup on Saturday. "He came up here to get some game-time but also to develop his own career," Duffy told BBC Scotland. "If we can get the best of both worlds with Denny - help the team and help him progress as a young player - we'll have a real find on our hands." Last season it was loan signing Declan McManus who helped fire the Greenock side to the Championship. McManus - now at Fleetwood Town - scored 23 goals on loan from Aberdeen and Duffy hopes former Celtic forward Johnstone can find similar form. "If someone gets 20 goals this year for Morton it will be an exceptional tally," said Duffy. "If we can get strikers in double figures I'll be delighted. "He was a young player at Celtic with a lot of potential; very highly regarded. He wants to be a part of a successful side, he didn't come up here just to get away from Birmingham." Morton open their Championship campaign on Saturday against Falkirk at Cappielow, before matches with Hibernian and St Mirren. "In essence, they're Premiership teams," added Duffy. "If you look at that division, there's nothing that would say other than it's going to be a very difficult season. "It's a huge opportunity for the players to go up against top-class players. Getting promotion last year was the aim but this season we will be trying to assess as we go along. "People keep asking me how we're going to do, but there's no way of knowing that until you get half a dozen games under your belt. I've got real confidence in the boys and if we can add one or two in key areas I think we can compete."